Eddie Dreams of Tsujita Ramen. Slurps Four Bowls Then Has a Really Weird Dream! There's no debating it, the bowls of ramen at Tsujita are my favorites in Los Angeles. I'm not only talking about the master ramen maker's famous 60-hour lovingly simmered, pork bone tonkotsu version either. That's the one where you can literally taste the bone and marrow lurking in all that porcine richness. All the styles of ramen at Tsujita are great—even the vegetarian selection is deep with umami flavor, infusing pungent bamboo shoots and woodear mushroom. I also slurped up Tsujita's crowd-pleaser dipping ramen a.k.a. tsukemen. And I ate all of these at one sitting. 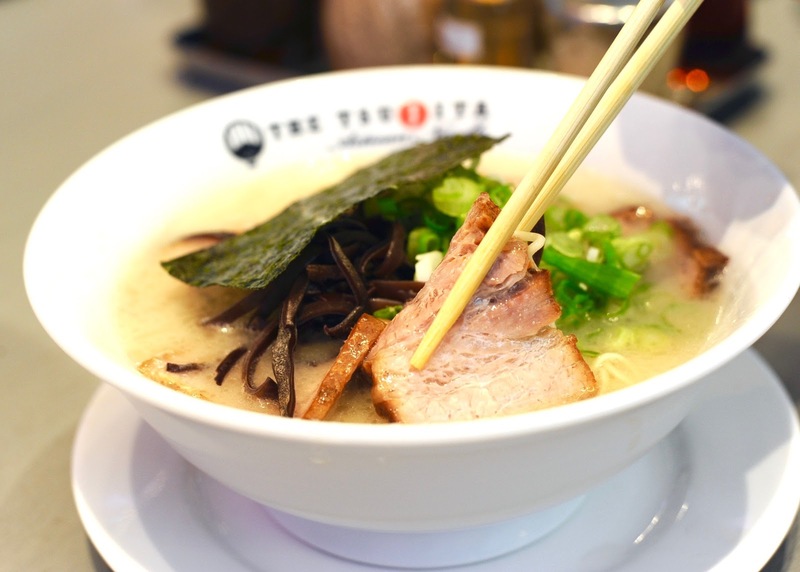 In the noodle world, tonkotsu is the Thanksgiving turkey dinner of the genre. I had two bowls of that particular style. Needless to say, a ramen-induced coma quickly descended upon me like a fluffy, down comforter on a chilly winter's eve. I was knocked out cold. Then, a dream fueled by mass ramen began to play in my head. The setting was a nondescript amphitheater. People were milling about before a music performance. I, however, was hellbent on scoring a photo with two celebrities at the event: Leonard Nimoy and William Shatner. Apparently, in my dream land, Nimoy and Shatner were performing songs from their respective albums—one night only! Yes, in our shared reality, there are actually record albums with the actors singing on them. For some in the real world, this fantasy concert would've been a dream show, but, alas, like Deborah Gibson sang, it was only in my dream. While the audience began settling into their seats before the show started, I urgently sought out the headliners of the night for the purpose of scoring the ultimate selfie with Kirk and Spock together, and then plastering it across all my social media platforms, surely to induce rage-filled jealousy in my friends, never-met friends, and random Comic-Con fan boys and girls alike. As I walked along a pathway, I happened upon Shatner. I asked him for a photo. He agreed and placed his hand on my shoulder, but then I hesitated and told him that we can't take the picture until we found Nimoy. He's a bit disappointed but came along anyway as we went in search of Nimoy. (Heh, get it? Nevermind.) After a little bit of looking, Shatner stopped following and I lose him. But as soon as this happened, I found Nimoy and asked if I could take a photo with him. He agreed. Then I told him that we first needed to locate Shatner so we can take the photo all together. He's okay with that, and off we went looking for Shatner. Unfortunately, we can't find Shatner anywhere, so Nimoy headed off to prepare for the concert. Now this time Shatner appeared out of nowhere and I told him to hurry with me because I was just with Nimoy. Reluctantly, he followed me for a while until his patience wore thin and then left me again. Repeatedly, I found myself wandering the amphitheater looking for Nimoy and Shatner. Once again, I'd spot Nimoy, but there'd be no Shatner in sight and vice versa, ad infinitum, while never ever getting Spock and Kirk together for the selfie. Now let's delve into some juicy dream interpreting. If you're in the least familiar with Star Trek, you'd know that Spock is all logic and reason while Kirk is the yang to the Vulcan's ying. Kirk is fiery, emotional, passionate, impulsive, carnal; Spock is deliberate, dispassionate, calm, analytical, cerebral. Looking through a Freudian lens, one could describe Spock as the superego portion of the human psyche as opposed to Kirk's id-like characteristics. Most interesting of all, in the frame of this Freudian model, I'd be the ego attempting to get id and superego together and act harmoniously long enough for a goddamn selfie (even that is symbolic: selfie is the self! ), so I could show off to my friends! Too much to ask? Why can't these two cooperate??? No wonder I'm so loco! Stop eating four bowls of ramen at a time is essentially the moral of this blog post. I'm going to have a salad now. Live long and prosper.